Welcome to Ringworld, an intermediate step between Dyson Spheres and planets. Ninety-three million miles in radius - the equivalent of one Earth orbit or 600 miles long - 1,000 meters thick, and much sturdier than a Dyson sphere. 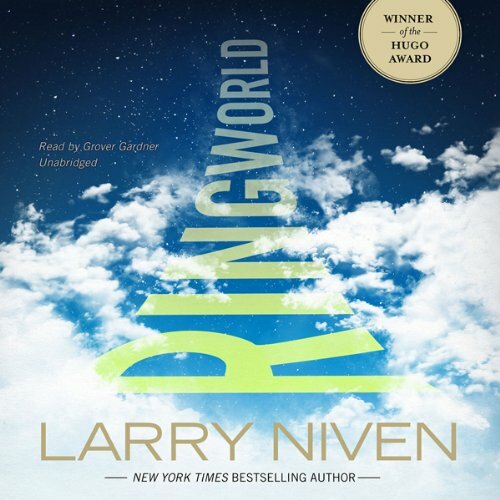 Larry Niven's novel, Ringworld, is the winner of the 1970 Hugo Award for Best Novel, the 1970 Nebula Award for Best Novel, and the 1972 Ditmars, an Australian award for Best International Science Fiction. First the bad news: The book is not world altering, life changing, deep, or otherwise valuable. It is occasionally insightful, but is primarily a romp through a novel and creative universe. As a romp it is first rate. Niven is excellent at creating novel concepts. He avoids nearly all of the cliches of space-based science fiction. His aliens are first rate, they are truly alien in both form and behavior. His universe has some creative twists, all of which are carefully thought out and explaind to the reader. Niven has a good grasp of the basic concepts of science, technology and engineering. While some of his ideas are fantastic, none of them are laughable. The plot is well crafted. There are few, if any, loose ends, and only a few minor inconsitencies. All the twists and turns make sense, once you hear them. He avoids the infamous "non-sequitor plot twist." The voice acting is also quite good. The reader avoids both monotony and over-acting, making it a pleasure, not a chore, to listen to. All in all this is one of the best quality books I've downloaded. Still Worth Listening 40 Years Later! 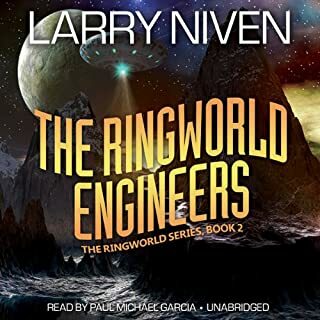 My husband has been telling me about Ringworld for about 10 years now, so when I saw it available on Auidble, I was excited to hear this book, which stuck with him since his teen years. This book is super unique and creative. It doesn't feel dated at all. 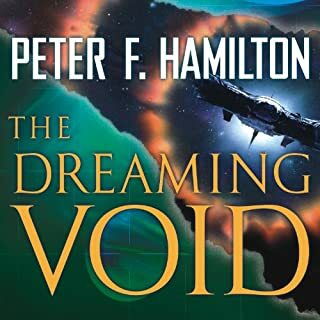 I also found it to be a very different kind of Sci Fi book, as much about the characters and their personal curiosities as it is about the RingWorld itself. 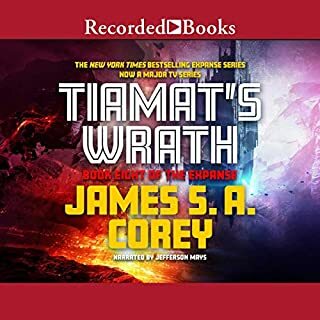 This is not a rock 'em sock 'em space war sci fi book - it's much more cerebral and about the characters from three different species trying to relate to each other while they learn the secrets of the RingWorld. My ONLY problem with this book was that it ended rather abruptly! I guess I have to listen to the next in the series. But this book is definitely worth the listen and totally earned it's Hugo! I chose this book because I like science fiction, and Ringworld appears to have stood the test of time. 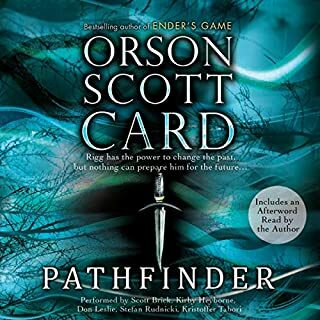 This book didn't exactly inspire me to want to listen to it all in one sitting, but it had enough of consistency and realism that it didn't get dull or boring either. 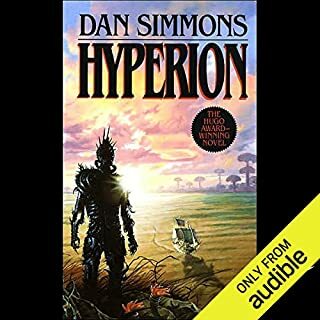 The strengths of Ringworld are that the framework of the universe in which it takes place is well fleshed-out, the history is developed enough to establish a backdrop for the story, the characters seem internally consistent, and the alien races don't just seem to be "humans with funny ears". Each race has their own motivations, goals, and unique characteristics, and that all combines well to propel the story line forward in a logical and consistent manner. The primary weakness of Ringworld, in my mind, is that the story isn't exactly compelling reading. 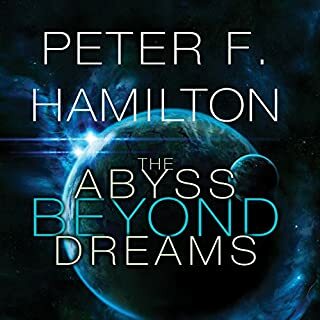 Things happen, but there aren't the plot twists, epic struggles, and so on that typically make up a piece of sci-fi....this book flows more like a historical narrative. The ending also left me feeling like there should be more; it just didn't finish well. That all being said, it's a great book for people who like a more technical science fiction. 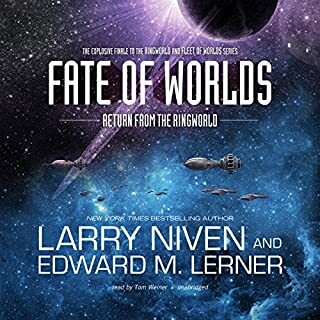 I am definitely going to be exploring Niven's other Ringworld books. If, however, you're looking for the proverbial "page-turner", I don't think Ringworld is for you. A great listen and worth the "read". 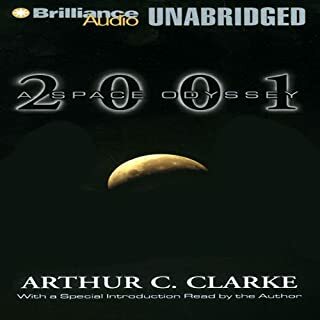 This is one of the first audible books that I had purchased and listened to. 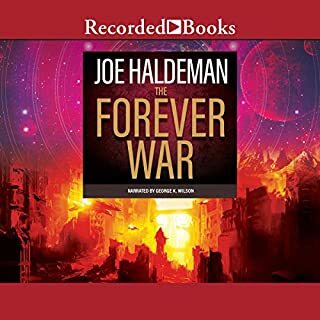 I'd heard about this book being in the top 20 lists of many Sci-Fi fans, and decided it was time to give it a listen on Audible. I was not disappointed. The reader is one of the best. It was very easy to discern amongst the many characters because of his changes in his narration. In my minds eye, I could vividly imagine being aboard with Tila and Speaker to Animals, and could see what they looked like, even when someone gets "burned". Great stuff. 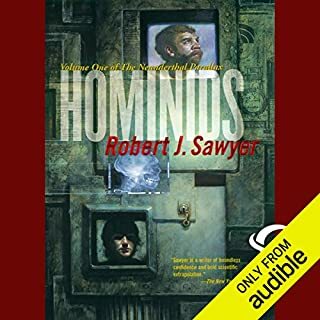 I would highly recommend this to any Sci-Fi, as well as Audiblefiles must have list. In 2850 AD, Louis Wu is at his 200th birthday party and thinking about how bored he is. The world has become homogeneous — everyone on Earth uses the same language, everything is available everywhere, and all the cities have lost their unique flavor. Life is dull. That’s why Louis Wu is a perfect candidate for the alien Nessus (a Pierson’s Puppeteer) who wants to take a manned spaceship to explore a strange phenomenon in space. Nessus also recruits a Kzin named Speaker-to-Animals who is a feline alien from a warlike culture, and the beautiful 20-year-old human woman named Teela Brown that Louis Wu has been sleeping with. She’s so silly that at first it’s not clear what she offers the mission other than good looks, “conical breasts,” a giggle soundtrack, and sexual gratification for Louis Wu (this is something I hate about science fiction written by men in the 1960s), but later we discover that Nessus knows that Teela Brown has lucky genes and he thinks having her along will make the voyage lucky. When the group stops off at the Puppeteer planet, they learn about their mission. They will investigate the Ringworld. Photos from space show that it looks like a blue ribbon arranged around a star. It’s about the size of the Earth’s orbit around the sun and it’s obviously artificial. The living area inside the ring provides about three times the Earth’s surface area, there’s gravity due to the ring’s centripetal force, and day and light cycles are created by shading the sun with huge panels. (Find the physics of Ringworld here.) The mission seeks to discover who created the Ringworld, why they created it, and whether they’re friendly or threatening. 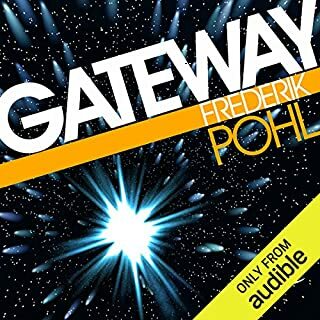 Ringworld is a high concept novel and I generally love high concept novels. Ringworld has big ideas in a grand setting. Images of Ringworld will stay with me forever. Unfortunately, the characters are dull and the actual action in Ringworld would fill only a few pages. While I wanted to explore and experiment on Ringworld, the characters were usually discussing, bickering, arguing, and philosophizing. 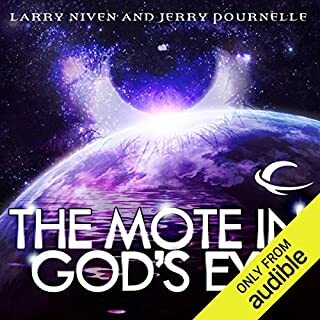 Some of this was interesting, such as the discovery that the Puppeteers were covertly performing genetics experiments on other species, the contemplation of what factors might make civilizations rise and fall (cycles of culture and barbarism is also a theme in the last Niven book I read, The Mote in God’s Eye). But much of it was teachy as characters spent too much time explaining evolution, genetics, meteorology, geology, and the physics and mathematics of the shape of orbits, velocities, heat transfer, and tensile strength. Worse, some discussion topics that started out interesting became repetitive and tiresome, especially the philosophical discussions about Teela’s luck which kept coming up and lasting too long. 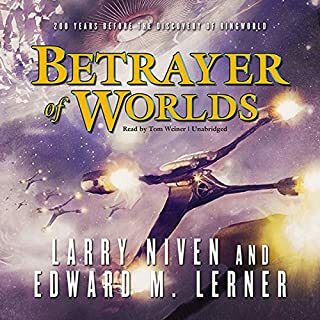 I love Larry Niven’s big ideas and I know he can write really exciting science fiction even if he can’t write decent female characters. Ringworld is a great idea that gets obliterated by dull characters and too much talking. (Yet it won the Hugo Award, the Nebula Award, and Locus Award.) 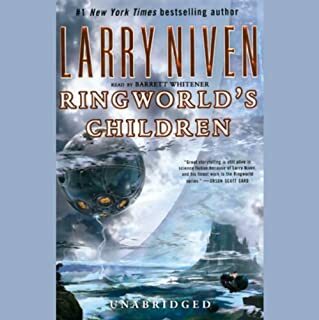 There are several prequels and sequels to Ringworld in Larry Niven’s RINGWORLD and KNOWN SPACE universes. I listened to Blackstone Audio’s production which was nicely narrated by Tom Parker. Fast paced, extremely unusual characters (as would be expected in any good sci. fi) fun to read even as this strange but fascinating story unfolds. Well produced and read. Has a teensy but-easy-to ignore echo from what tape audio engineers call "print through" (magnetic tape as it lay curled up slightly magnetizing the echo of one loop onto the last wind of the tape.) No big deal. Easy to see why this one won a Hugo award. This is SERIOUS Science fiction! 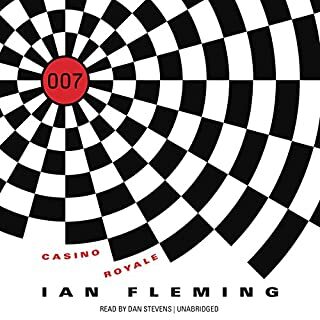 (not a downer it just has very strange characters) The author is skillful enough to make the extremely strange characters and setting seem normal. If you're not into "extremely weird" - (but again still so very human), you might not enjoy it. As far as the story goes, the Ringworld universe is a fascinating place. Unfortunately, Niven doesn't invest as much time into his character interaction as he does into the back story. On the technical side, there is a definite, annoying ghost echo of the narrator's voice, lagging about a second behind. It's distracting and disappointing to say the least, and something that Audible could fix by running a simple audio filter on it. The book is a must-read for any science fiction fan; however, its rich descriptions might be better served in their original book form. I often found myself wanting to skip back a few seconds and listen again to certain passages. Still, if you can't find the book, getting the audio book is definitely worth it. A most excellent story! Well developed, interesting characters, great storyline and a great concept. 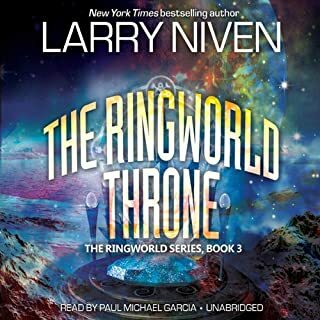 I've now noticed there is a whole "Ringworld" series and I hope Audible gets the rest. I would love to revisit the most interesting Ringworld. My only problem was the odd rather truncated ending. I think a few more plot points needed to be completed before he ended it like he did. You must keep in mind that this was published in 1970. It was an excellent book for the time. If you want to say you are a sci-fi lover, than you must do your homework and Niven and this book with The Integral Trees is a most. Even reading it today, you have to be amazed by the size and scope of this artificial world. It was a million miles across. The United States is around 3 thousand miles across. Niven uses a lot of math, but not to the point where the common layman gets lost. Today this is still an interesting read. I thought their was good character development in this book. I especially liked the Puppeteer and the Kzin. These were interesting characters and they added much to the story. I will admit that before it was over I was ready for it to end. Part of that reason maybe because I have read it multiple times. Today's young reader may not be as excited about it as we were in the 70's, but I believe they will still enjoy it. The novel is based around travelling to and investigating a mysterious artificial world. 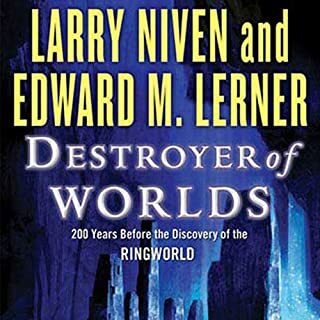 While the ring world would seem to be the focus of the book and was, in fact, quite interesting I found that it was the, more or less, related ideas that made the story sing. There are three intelligent species in the novel. They are quite simplistic in nature in that the Puppeteers are excessively cautious and fearful but very intelligent, the Kzin are (or were) ultra-aggressive and the humans are in between. But there are interesting caveats to these such as the only ambassadors of the Puppeteers are those that are considered by their own race to be insane because only such a one would brave close contact with such unpredictable species. Or the much discussed evolution of the Kzin toward a more reasoned nature. The most fascinating facet of the novel to me was the discussions regarding the nature of luck that suffuse the story throughout. Earth has a complex system of laws controlling reproduction wherein each human has the right to one child and more can be won through various means such as purchase, arena combat, exceptional genes, etc., but the salient of which is by lottery. The laws in themselves are intriguing but it gets really fascinating when one human crew member is chosen because her ancestors up to 5 generations back have been lottery winners and this woman has led a particularly lucky existence thus far. The Puppeteer believes she has been bred for psychic luck via the lottery while the other human argues it is simply the far end of a probability curve. Someone out of billions of people was bound to have ended up lucky in most things even if their odds were no better than anyone else and they won't have any better odds than anyone else in the future either. Either could be right and what starts as an interesting speculative argument becomes all the more entertaining and complex as the truth is revealed. I won't ruin the magic but it's quite brilliant. The listener will also be treated to many more mysteries and audacious ideas such as the history of the ring world and its people, conspiracies of the man and Kzin wars, future tech, traveling planets, and exploding galaxies. The narrator was mediocre. All of the voices sound pretty much the same with the only differentiation being more or less enthusiasm or gruffness but no truly different accents or anything. He did, however, do a good job relaying the character's emotions and only the narration (not the dialogue) was monotonic. 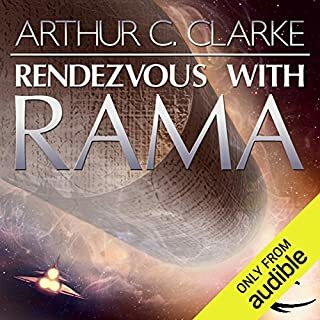 IN SUMMARY, this is a quirky and thought-provoking adventure in the same vein as Hitchhiker's Guide to the Galaxy or Dimension of Miracles that anyone who enjoys scifi should consider worth a listen.